This tour gives you a wonderful opportunity to take in some of the most breathtaking scenery of Andalucia, the park is massive it covers over 50,000 ha. and it straddles the borders of both Malaga and Cadiz provinces. This mountainous region provides spectacular views of superb limestone landscapes overlooking forested hillsides and lush green valleys. 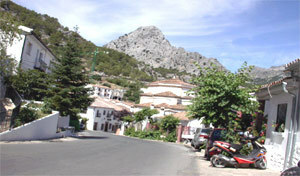 The picturesque village of Grazalema provides a fitting centrepiece to my favourite part of Spain. The rugged terrain, characterized by sheer cliffs, precipitous gorges and subterranean galleries provides a home for a great variety of birds and some highly sought after species. 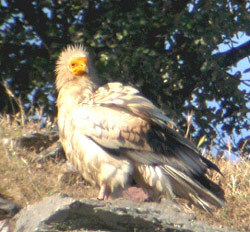 Hundreds ofGriffon Vultures breed here alongside fewer pairs of Egyptian Vultures, Bonelli’s and Golden Eagles.Eagle Owls and Peregrines share this habitat with Red-billed Chough and White-rumped Swifts, whilst smaller passerines include: Rock Sparrow, Rock Bunting, Blue Rock Thrush and Rufous-tailed Rock Thrush. Black Wheatears are resident and are fairly easy to find, they are joined in the spring by Black-eared Wheatear, Subalpine, Orphean, Olivaceous, and Bonelli’s Warbler. In the scrub you may findWhitethroat and several other Sylvia Warblers, Woodlark, Thekla Lark, Tawny Pipit and the fertile valleys attract Golden Oriole, Woodchat Shrike, Wryneck, Yellow Wagtail, Hawfinch, Turtle Doveand Cuckoo. Over 1300 tax of vascular plants have been recorded in the Parque including, 6 narcissi, 7 irises and 27 orchids. 75 species of butterflies are also of interest: both Swallowtails, Spanish Festoon, Black-veined White, Large Tortoiseshell, Cardinal and many Fritillaries, Hairstreaks, Graylings, Blues and Browns, one of my favourites is also found there, the Two-tailed Pasha. An early start will find us winding our way up through the villages of Gaucin, Cortes del la Frontera, Ulbrique, Benaocaz and Villaluenga del Rosario before reaching Grazelema. There will be plenty of stops along the way and one or two short walks. From Grazelema we a take a circuitous route via Zaraha and its Azure coloured reservoir, again we will take short walks to gain maximum exposure to this gorgeous area. Various miradors that overlook the cork oak forest, open scrub valleys and pine forests. We will stop at Puerto de las Palomas, Puerto del Boyer and Puerto de los Acebuches. A stop off at the bridge over the Rio Guadalete will provide the opportunity to add Hoopoe, Bee-eater, Bonelli’s, Willow and Melodious Warblers and overhead we must check the Swifts for Pallid, Alpine andWhite-rumped varieties. The raptors will be pretty good too, Vultures, Eagles, Falcons andKites may appear at any time. You will enjoy a fantastic day out on this trip and see some of the most beautiful scenery found anywhere in Spain. Don’t miss it.